This guy’s a lot of bull! Today, Ruiz Manuel, a Spanish bullfighter, gave us a brief lesson in el toreo, la fiesta brava. Ruiz is doing a tour of Latin America, fighting in Colombia, Venezuela and Mexico. 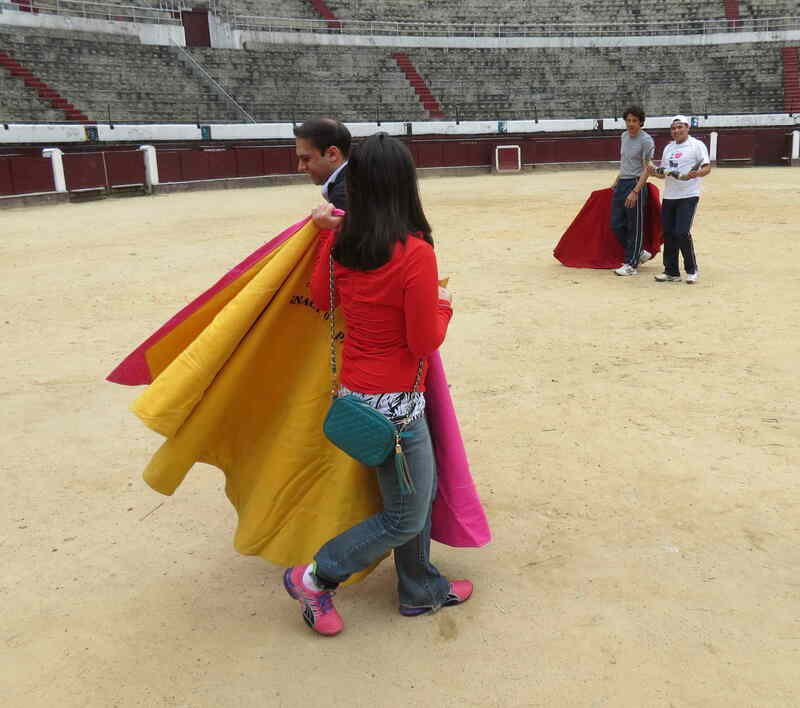 Although Bogotá Mayor Gustavo Petro has prohibited bullfighting in the Santamaria Plaza, bullfighting continues in many other parts of Colombia. Ruiz is a thoughtful defender of his art. He asserts that the bull does not suffer – much – since it’s consumed by the passion of the battle. He points out that bulls raised for fighting are a special breed which wouldn’t even exist if not for bullfighting, and that they live much longer and in much better conditions than do animals raised for meat or milk. “They live like kings,” Ruiz says. That is true to a great extent. Fighting bulls grow up free in the fields. Compare that to living crowded in a dark barn, as is the case for many animals raised for milk and meat. “We bullfighters love animals,” Ruiz told us, altho some animal rights activists might say they have a strange way of expressing love. Ruiz also has an eye for the ladies. 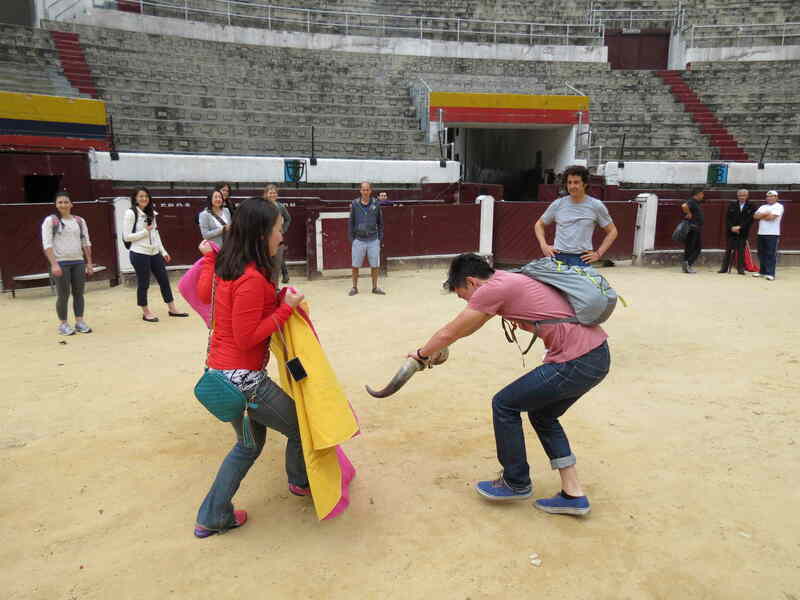 “Bullfighters are very special people,” he told us. I observed that humility wasn’t one of his strong points. He didn’t disagree. “If I don’t sell myself, then who will?” he asked with a grin. “My grandmother isn’t around to do it for me.” A fair point. 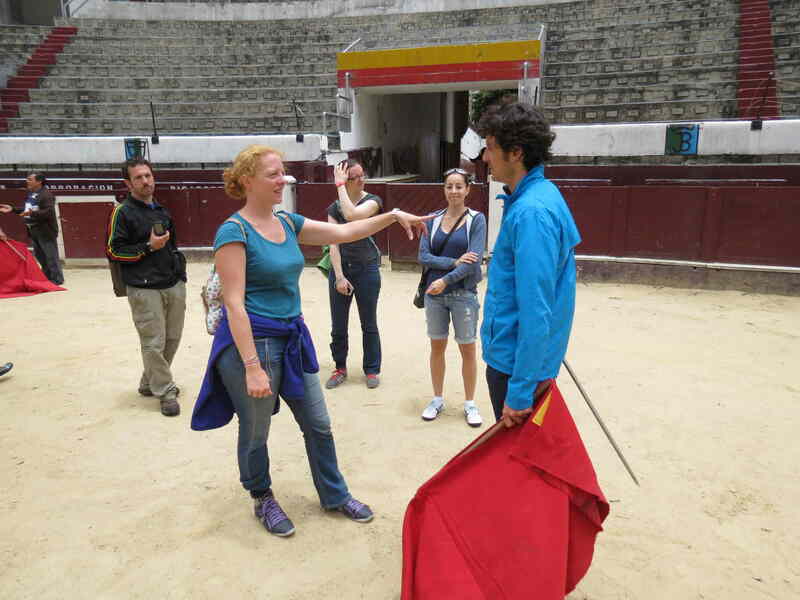 This entry was posted in Uncategorized and tagged bike tours, bullfighting. Bookmark the permalink.